Two really bad and blurry shots taken with an iPhone at the Spring Arts Fest opening reception tonight at the East Hawaii Cultural Center gallery in downtown Hilo. I wrote previously about getting two photographs into the show. 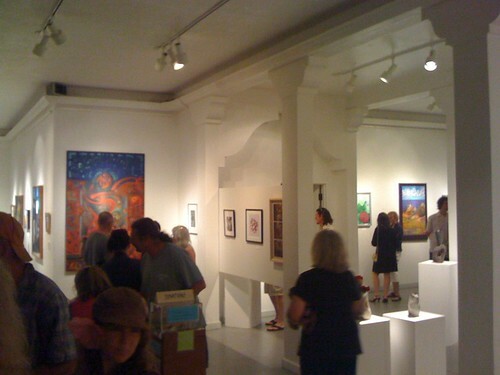 The show was hung very nicely and I really felt the juror made some good selections. 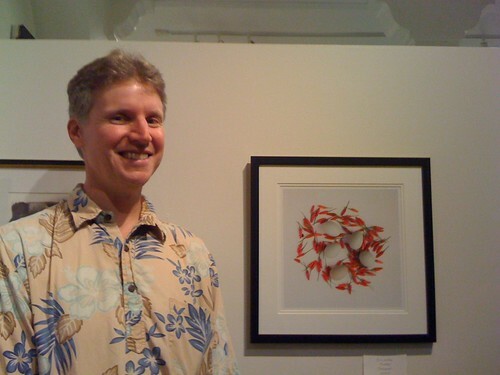 The juror is a painting instructor, and paintings earned the top three prizes. There was one heavily processed photograph in the honorable mentions and all the rest of the HMs were also paintings, IIRC. At least some photography, sculpture, drawing and fabric art also made it into the show. There was a good turnout for the opening and some nice food at the buffet. Eric, so I have to ask, in your opinion, did the top three prizes go to paintings because they clearly deserved it or was there perhaps some unintentional favor because that’s what the juror was most familiar with? I’m asking because I’ve observed before what I thought was favoritism towards paintings in mixed media shows. I’d like to think there was no favoritism, but it kind of looked that way. I liked the paintings that were exhibited, but personally even if I was only giving out awards for paintings I wouldn’t have given them to the three that won 1st, 2nd 3rd. Art is art, though, and what he saw/felt was obviously different than my own opinion.